Liverpool welcome Roma in the first leg of the first semi-final of the UEFA Champions League. This is the sixth European meeting between the two sides and the first since March 2002 in the second group stage of the Champions League. 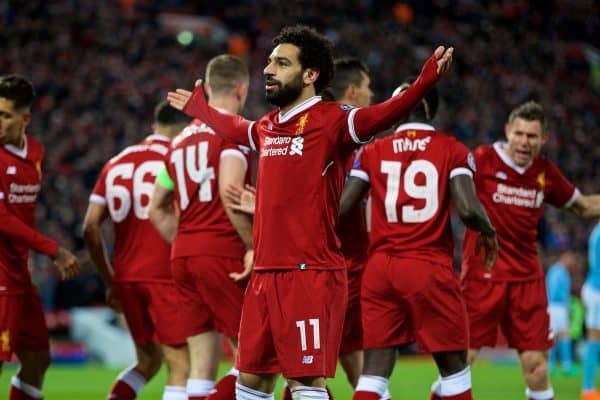 Roma will come up against a familiar face when they arrive at Anfield, with Mohamed Salah likely to start for Liverpool following his PFA Player of the Year win on Sunday evening. Klopp will recall all his big names after making five changes at the weekend, meaning a probable return for Dejan Lovren, Andrew Robertson, Roberto Firmino and Alex Oxlade-Chamberlain. Nathaniel Clyne is likely to be on the bench after missing Saturday’s draw against West Brom with a muscle injury, but has now recovered. For Roma, Diego Perotti could make a return after being sidelined for three weeks, although Rick Karsdorp and Gregoire Defrel are set to miss out with injury.